Wirelessly Mirror your Windows computer screen and sound to your ChromeCast or Apple TV. Have you ever asked yourself How To Mirror PC to Apple TV or ChromeCast? iPhone and iPad allow you to AirPlay mirror what’s on their screen to your TV via Apple TV. Android Devices allow you to Cast mirror what’s on their screen to your TV via ChromeCast. AirMyPC allows you to do the same from your Windows Computer by adding Windows AirPlay and Cast screen mirroring capabilities. With AirMyPC, Windows AirPlay sender, you can use AirPlay or Cast to stream music, photos and video from your computer, wirelessly to Apple TV or ChromeCast devices that are on the same Wi-Fi network as your computer. Everything is done Wirelessly. No wires are needed. Once Installed, AirMyPC is able to Wirelessly send everything you see on your computer screen and everything you hear on the computer speakers to your TV. With AirMyPC you can choose whether to Mirror only the computer desktop screen, whether to Mirror only the computer speakers or whether to AirPlay Mirror both. In addition to Desktop Mirroring, AirMyPC lets you to Airplay your WebCamera to your TV. This cool feature allows you Airplay yourself and your surrounding to your AppleTV or ChromeCast devices including streaming the WebCamera Microphone as well. 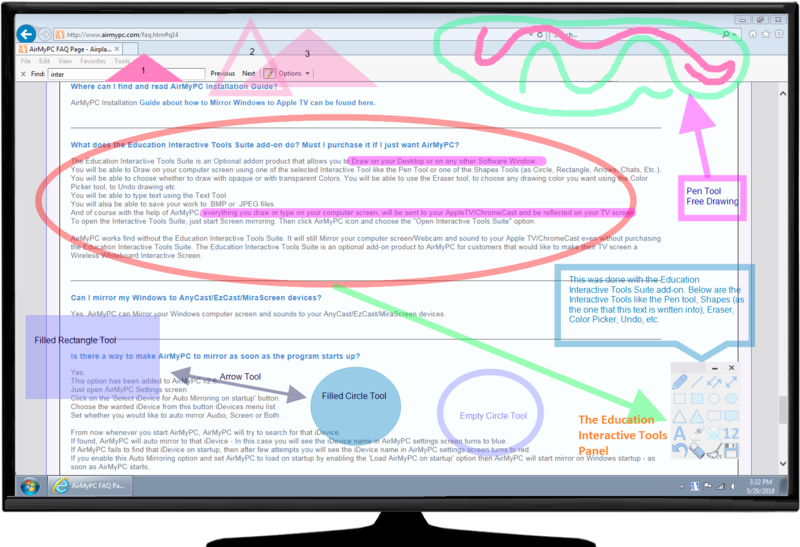 The Education Interactive Tools Suite add-on will leverage your using experience by making your TV screen a Whiteboard Interactive Screen. This Education Interactive Tools Suite gives you the option to Draw and type on your Desktop or on any other open Window. With the Interactive Tools Suite add-on you can Draw on your computer screen using the Pen Tool or using one of the the other Shapes Tools (as Circle, Rectangle, Arrows, Chats, Etc.) with opaque or transparent Colors. You will be able to use the Eraser tool, the Color Picker tool, the Opaque tool, Undo tool etc. You will be able to type text using the Text Tool. You will also be able to save your work to files. And of course with the help of AirMyPC, everything you draw or type on your computer screen, will be sent to your Apple TV or ChromeCast devices and be reflected on your TV screen (As can be seen in the TV image below). * The Education Interactive Tools Suite is an optional add-on product. AirMyPC will work fine without it by mirroring your PC screen and Webcam to your Apple TV. And for now, you can have if for only $14.95. Or for $14.95 ($29.9) in case you purchase AirMyPC with Interactive Tools Suite optional add-on. * WebCamera mirroring is available with Win7 or later. ** Education Interactive Tools Suite is an optional add-on. Download Free fully functional trial for 7 days and start mirroring your Windows computer screen and sound to your ChromeCast or Apple TV. Order AirMyPC now for $14.95. Or for $14.95 ($29.9) in case you purchase AirMyPC with the Interactive Tools Suite optional add-on. Learn how to Mirror your Windows PC screen and sounds to your AppleTV Or ChromeCast devices. Copyright © 2014 - 2019 AirMyPC.com. AirPlay/Apple TV/iPhone/iPad/Mac are trademarks of Apple Inc., registered in the U.S. and other countries. Google Cast/Android/Chromecast are trademarks of Google Inc.